uncube's editors are Sophie Lovell (Art Director, Editor-in-Chief), Florian Heilmeyer, Rob Wilson and Elvia Wilk; editorial assistance: Susie S. Lee and Leigh Theodore Vlassis; graphic design: Lena Giavanazzi; graphics assistance: Madalena Guerra. uncube is based in Berlin and is published by BauNetz, Germany's most-read online magazine covering architecture in a thoughtful way since 1996. With buildings like concert halls, acoustics are a prime generator of form, yet all architecture creates and reflects the sensory tonal environments in which we live. Nevertheless, the technology allowing in-depth understanding of how sound affects and is formed by space has lagged way behind in our visually fixated world ­– until recently. uncube turns 21 with a whole issue dedicated to sound in built space; tuning in to surprising stories about acoustical masterpieces, sounding out audio experts and pricking up our ears towards cutting-edge advances in the world of acoustics. Listen up as uncube goes audio. Photo: All images unless otherwise noted courtesy Nagata Acoustics. The sound of space is one of the most complex engineering problems faced by the architect. People have been building structures for performance for millennia, but it’s only in the last century that we′ve started to understand why some physical spaces sound better than others. Yasuhisa Toyota is one of the world′s leading acousticians today. As President of the US division of Nagata Acoustics, a company set up in 1971 by Dr. Minoru Nagata, Toyota has worked on some of the most significant performance venues of the past thirty years. He has also seen the technical sophistication of his profession expand exponentially since his first project, Suntory Hall in Tokyo, designed by Yasui Architects, was completed in 1986. Toyota gives a potted history of contemporary acoustic design. It wasn’t until the Boston Symphony Hall of 1900 that an engineering approach to acoustics was first used. Designed by the pioneering Chicago firm of McKim, Mead and White, it was acoustically engineered by Wallace Clement Sabine, a professor of physics at Harvard who defined what we now know as reverberation time, thanks to some ad hoc experimentations in the college′s lecture halls. Barely a few decades before, major concert halls like the Royal Concertgebouw in Amsterdam (1886) or Vienna′s Musikverein (1870) achieved their acoustical brilliance through luck rather than judgement. Scharoun’s hall revolutionised concert hall design, not only in the expressionist, abstract gold-coloured façades, but inside, where a raised stage was surrounded by terraces of seating that seem to cascade around it. Acoustically it is highly rated and provided the model for many subsequent structures. While modern halls are neatly divided between these two forms, the architectural approach demands to be unconstrained. Traditional methods of deciphering the patterns of sound before a building is completed are no longer enough. “The computer technology we use has only been developed in the last 20 years” says Toyota. “Before that we used physical scale models”. For the Suntory Hall, for example, divining the acoustics meant building a sizeable and expensive scale model. “If possible, we build a 1:10 model – this isn’t small, for it means that a 20-metre-high auditorium is represented by a two-metre-high model. You can walk into it – it’s huge.” He goes on: “the major benefit of a model is that we can use actual sound, in 1:10 scale waves. This means the frequency of sound used in the model should be ten times higher than normal. We used to convert to these higher frequencies by changing the speed of a cassette recorder – that was how we did Suntory Hall – now computers have taken over.” Major recent projects by Toyota include Jean Nouvel’s Koncerthuset in Copenhagen and the Helsinki Music Center by LPR Architects. Both still required massive 1:10 scale models to hone and refine the sound of the performance space. “We use them to check the detrimental echoes. It’s still the only way to discover these, as computer simulations can’t detect echo problems”, Toyota explains. Elaborate and expressive shapes are nothing if they’re not acoustically suitable. “It’s not easy to change a design once you’ve built a scale model, so we start with a computer model, which is far more flexible,” he continues, explaining how computation plays an essential major role in modern hall design. Perhaps the best example of how the game has changed is Frank Gehry’s Walt Disney Concert Hall in Los Angeles, completed in 2003. “What we could study in terms of room shape was very limited before, but now we are looking at developments in architectural design”, says Toyota. “Gehry won the competition in 1988 or 1989 and we were chosen in the selection. Back then, they didn’t have CAD software, and we were still developing our programmes on Workstations, which are very big computers”. After the basement parking garage was built, the project was placed on ice in 1996. “When they started again, it was after Gehry had completed Bilbao and there had been these big developments in computer design”, Toyota says, “so when Disney re-started the design it was totally different to the original. We had to develop our own technology to follow them”. The end result is specialist software linked to high-end CAD packages: “we can now do an acoustic check in a seamless way”. Yasuhisa Toyota studied at the Kyushu Institiute of Design and is one of the world’s leading acousticians. He has been chief acoustician on over 50 projects worldwide, including the Walt Disney Concert Hall, Suntory Hall in Tokyo, the Bard College Performing Arts Center in New York, and the Kauffman Center for the Performing Arts in Kansas City. Current projects include acoustics for Herzog and De Meuron’s Elbphilharmonie concert hall in Hamburg, Germany, due for completion in 2017. He is the company director and US Representative of Nagata Acoustics of Tokyo. Ultimately, fine acoustics is a subjective art. Measurable statistics like reverberation time only tell half the story. “When I was working on Suntory Hall, I explained how reverberation time worked to the clients. They asked if it was something like an alcohol percentage; did the number guarantee the quality of the whisky? No. But how can you describe the quality if not through a number? It opened another eye for me.” You can’t quantify a concert hall through statistics. “It’s like reading an X-ray”, Toyota continues, “it’s not always clear to us, but a doctor with many years of experience can make an evaluation without numbers”. In 1958 Le Corbusier was too busy working on Chandigarh to focus his attention on a comparably minor commission: the Philips Industries Pavilion at the World’s Fair in Brussels. So Corb outsourced the project to Iannis Xenakis – the renowned Greek composer who at that time was up-and-coming in the architect’s firm – with the assignment to create an “electronic poem”. How’s that for a brief? The Ark Nova inflatable concert hall was conceived in the aftermath of the 2011 tsunami in Japan. It is a reusable venue designed to tour the most badly affected areas, supplementing a still patchy live arts provision for the local population. The project was initiated by the Lucerne Festival, a Swiss international music event that traditionally has strong links to Japan. It takes its inspiration from Noah’s Ark pitching up after the biblical flood, though it does not carry “people and animals to escape from disaster” – as the Festival’s artistic director Michael Haefliger puts it – but is “packed with music and various arts” for the “long-term rebuilding of culture and spirit”. Arata Isozaki, born 1931 in Ōita, Japan, studied architecture at the University of Tokyo, graduating in 1954. After working in the office of Kenzo Tange, he established his own firm, Arata Isozaki & Associates, in 1963. He has since built around the world including in Europe, Central Asia, the Middle East, China and North America. Celebrated projects include the Museum of Contemporary Art (MOCA) in Los Angeles (1981-86) and the Kyoto Concert Hall (1991-95). In 2005, Arata Isozaki founded an Italian branch of his office, Arata Isozaki & Andrea Maffei Associates. A current project includes an office tower in the new CityLife Business District of Milan. He was awarded the RIBA Gold Medal in 1986. Anish Kapoor, born 1954 in Bombay, India, has lived and worked in London since moving there in the early 1970s to study art at the Hornsey College of Art, then at the Chelsea School of Art. He represented Britain in the 44th Venice Art Biennale in 1990 and was awarded the Turner Prize in 1991. Celebrated projects since include his 2002 Unilever Commission Marsyas in the Turbine Hall at the Tate Modern, Cloud Gate in Chicago's Millennium Park; Leviathan at the Grand Palais in Paris in 2011; and ArcelorMittal Orbit, commissioned as a permanent artwork for London's Olympic Park in 2012. He received a knighthood in 2013. The design of the building, looking somewhat like a giant plum, is a cooperation between Japanese architect Arata Isozaki and Indian-born, London-based artist Anish Kapoor. At 30 metres wide, 36 metres long and 18 metres high, its structure is a lightweight translucent purple membrane, inflated by a series of air pumps in around two hours – which can be deflated, folded up and loaded onto a truck for easy transportation between venue sites. It provides a flexible space that can accommodate audiences of up to 500 and all types of stagings and performances: from traditional orchestral concerts to in-the-round multi-stage contemporary music events. Alape launched their EW 3 model 44 years ago, and to date, this revolutionary basin is still an icon in bathroom design. With its compact, round shape, and immaculate white glaze, EW 3 was designed as a built-in basin for washstand surfaces. It was the first industrially produced basin of its kind, and its visionary design, which eliminated the need of a separate ceramic basin, marked a revolution in bathroom architecture. The EW 3 basin became incredibly popular, as it fitted perfectly in smaller homes. With EW 3.2 a revised version is now been unveiled, which will not replace the classic model but rather complement it as a modern and technically advanced alternative. Both products are available in parallel – with their circular shape and the typical kidney-shaped hollow, designed for use with a single-lever mixer on the edge of the basin. EW 3.2 incorporates state of the art features employing the latest manufacturing technology advancements. Its most prominent feature is the omission of the PVC tape, which seals the border between basin and countertop. Thanks to new edge treatment methods, this tape is no longer needed in the new version. The EW 3.2 is easily and invisibly sealed with silicone, which also makes it absolutely watertight. Four fixing clips also prevent the basin from slipping out of position on the countertop. Thanks to a new fully glazed white bottom, it is now also possible to integrate the basin harmoniously into open systems, which are often preferred in architectural and interior design projects. With an edge height reduced by two millimetres, the EW 3.2 appears even more delicate. These extremely subtle modifications enhance and perfect one of the most significant and certainly most inspiring basins in the history of bathroom design, whilst staying true to its original idea. Both models are presented at the same level: Whether the EW 3 or EW 3.2 - it's the customer who makes the decision. The new EW 3.2 version lines up naturally within A form's extensive collection, with the widest range of shapes and varieties in the sector. ALUCOBOND® LIGNO composite panels are real natural beauties: four different wood look finishes featuring the sophisticated character of wood. The look is so natural and authentic because the wood grain pattern is not repeated, even in five-metre long panels. The flatness and flexural strength of these lightweight panels, mean ALUCOBOND® LIGNO is ideal for numerous different facades - both in large formats or as narrow slats. In addition, the panel’s diverse processing options ensure the greatest possible architectural scope. Panels can be folded into complex and multi-dimensional shapes or given a sharp and precise geometry using routing and folding. The extreme durability and weather resistance provided by ALUCOBOND® LIGNO composite panels mean they outperform natural wood. The panels are resistant to fungus and rotting, and protected against moss growth and weathering. ALUCOBOND® LIGNO is fully recyclable and demonstrates a highlevel of sustainability in the life cycle of the material. The new brick ranges of Hagemeister combine the look and feel of traditional artisan masonry and historical industrial culture with the high quality and long life of modern bricks. The retro looks of the “Haltern” and “Werne” ranges recall the long tradition of industry with its collieries and progressive company housing that shaped the urban environment. The raw finish of the new bricks with their chalk white streaks is reminiscent of recovered historical brick architecture and gives modern buildings an expressive touch. The different hues and the matte or smooth coal-fired accents capture sunlight and artificial light in unique ways and add a breath of life to large facades. The latest innovations in light and building technology were presented at Light+Building in Frankfurt. Gira introduced the new multi-talent for building technology Gira G1, the new modulator door station in Gira System 106, new metal variants in the Gira Esprit switch range, and the Gira eNet. In addition to these Gira was introducing even more exciting new products at Light+Building 2014, including the Gira KNX energy meter Comfort, the Gira logic module, and the Gira KNX presence detector Mini. You can obtain a complete overview of the new products and the current Gira building technology ranges online and in the "Gira Light+Building 2014 Report". The report is available in German/English. The Gira Esprit switch range has been expanded with the appealing combination of linoleum and birch plywood. The two materials are being used together in a switch range for the first time and have quite a bit in common: They both have natural origins, feature sustainable production methods, are rugged, have a variety of uses, and have always been popular among architects and designers. Frames in six attractive colours offer freedom for diverse combination options in interior design. Gira Esprit Linoleum-Plywood is the ideal choice for interior design concepts in which a clear form and natural materials are favoured. The new frames are available now. Gira Esprit Linoleum-Plywood unites two natural materials which complement each other perfectly within one switch range. Both are sourced from renewable raw materials, are robust, have a variety of uses. Gira Esprit Linoleum-Plywood has a lower ecological impact than conventional frames made of polycarbonate. Its global warming potential is approximately 75% lower than a 1-gang reference frame. The consumption of fossil energy sources is significantly reduced by using less plastic made from crude oil. The values will be calculated as part of a life cycle assessment. The process chain is studied from the raw material extraction to the factory gate (cradle to gate). Under the motto “Imagine a world with linoleum”, Armstrong presented its new DLW Linoleum collection just in time for the 150th birthday of the natural floor covering. Its themes are true stand-outs: linocuts with top architectural elements in powerful colours. The website www.imagine-linoleum.com/en invites visitors to take a fascinating journey through the world of DLW Linoleum. With the collection, the selection of these linoleum structures made in Germany is now markedly broader and more varied: Nine different patterns in many brilliant colours as well as subtle greys and natural hues can be harmonically combined with one another. A highlight of the collection is the Uni Walton, especially “Spanish brown” - it reflects the look of the first linoleum 150 years ago. Lino Art Star and Colorette just glow with joie de vivre and with their fruity fresh look. Predominantly made of natural renewable raw material: It is made of 98 % organic materials. The technology to hear spaces that don’t exist has been around for decades. The hardware and software that make it possible have developed alongside leaps in processing power. In recent years virtual visuals in the form of 3D rendering have moved from laboratories to studios, mainframes to desktops, and laptops to smartphones. Virtual listening has lagged behind, but it is coming soon to the personal device. What are we going to do with it when it gets there? It is a strange fact that most architects don’t have to study acoustics, but there are others involved in buildings that probably shouldn’t have to. Manual methods and early software for predicting how spaces sound are expressed in graphs and charts that risk limiting the discussion of acoustics to expert maneuvers of ego, performed in jargon. Listening is more democratic, even if people listen differently. That’s why musicians take ear training. Auralisation is the process of making data audible, but before that was reasonable to do for every project, visual tools were used. The global engineering firm Arup has been in the virtual acoustics business since 1990 and operates an acoustic consultancy with sound labs in all major offices. For Norman Foster’s Greater London Authority (GLA) building, completed in 2002, Arup built an in-house plugin for 3D Studio Max to iterate the design. Arup’s Global Acoustics Lead, Raj Patel, describes the original chamber design as “a big glass box that curves all the way to the top” and analysis indicated that it would have too excellent an echo. Echo is okay for some music, but not for speech. 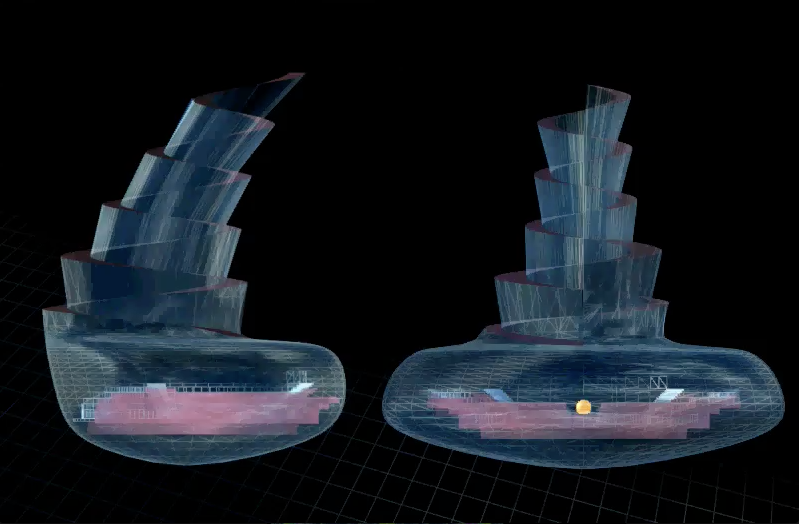 The simulation was first run in 2D for the sake of speed, and once an approach of offset balconies and sound-absorbing treatment looked like it would work, modelled in 3D overnight. “It took every single computer we had in the office, daisy-chained together”, remembers Patel. Today the auralisation of performing arts spaces is SoundLab’s bread and butter. Sound waves are modelled using algorithms to predict the intensity and direction of reflections off surfaces with different acoustic characteristics in 3D. For the most complex curved spaces, physical models with miniature speakers and receivers at ultrasonic frequencies are still used. The result is what Patel calls an “acoustic signature” that represents the response of the room to a specific signal. Physically, the lab is a sphere of speakers housed in a sound isolated room, softly humming with computers. You sit in the middle, exposed on a high chair, and hope nothing horrible happens. What you hear is the live combination of the acoustic signature of a room and a sound, like somebody playing the oboe or talking (recorded without echoes in an anechoic chamber.) The power of the system is that it can switch “rooms” in milliseconds, a kind of teleportation by aural prosthesis. SoundLab is a prosthetic system more like the internet than an implant, and it lets a group of people hear impossible things. This ability has revolutionised some design practices already. For example, new performing arts spaces have a benchmarking stage where the architect, engineer, and client fly to a few important halls to compare them. Vienna’s Musikverein and Amsterdam’s Concertgebouw are often on the list. But how do you compare two rooms when you’ve travelled for a day between them, or listened to different music in each one, or sat in different seats? SoundLab toggles between simulations of the same piece performed in dozens of halls in real-time. Doing this makes you doubt what anybody means by a “great” room, and forces project teams to find shared vocabulary for acoustic terms like warm and dry, presence and intimacy, while young designers can quickly develop their acoustic intuition. “Instead of having to take them to a hundred buildings, which might take five years, you can just spend a bit of time listening to this room”, explains Patel, “and tell me where it differs from what you expect”. SoundLab is not limited to concert halls. Arup helped Michael Arad and Handel architects with the World Trade Center memorial, focusing on two problems: designing the soundscape as a visitor moves from Fulton street down to the memorial and into the museum, and making a cost-effective proposal for isolating the museum’s auditorium from subway noise. The disappearance of the city as noise is central to the power of the WTC memorial experience; you enter the plaza (after a surreal airport-security check) and feel transported. Arup built a 3D acoustic model to make sure this would happen. For the auditorium, a glance at the graphs might suggest that sonic isolation of both the room and building is required, but a perceptual investigation using auralisation can ask: “When do you know a train is a train?” What is audible is not the same as what is intrusive. Lev Bratishenko is a writer whose work has appeared in Abitare, Canadian Architect, Cabinet, Gizmodo, Icon, Maclean’s, Mark, Triple Canopy, and other publications. He lives in Montreal, where he covers classical music for the Montreal Gazette. In 2010 he curated the exhibition The Object is not Online at the Canadian Centre for Architecture. Wave field synthesis is the newest technology in virtual acoustics. This system produces a large area of accurate 3D sound so you can move about in a space and it still sounds real. Soon, you could put yourself in a hamster ball with an Oculus Rift and “walk through” a design, listening to your footsteps change as you toggle between marble and wood. After this is accomplished, the next technical challenge will be a full sensory simulation with lighting that warms your face, and systems to replicate the instant feeling of opening a window. With his travelling installation Playing the Building, our favourite Talking Head – David Byrne – has managed to convert entire buildings into musical instruments. The chosen building’s latent symphonic qualities are activated by the keys of a vintage chapel organ, which tug specific cables rigged throughout the building to instigate wind, vibration, or physical contact on the architectural surfaces. The inherent resonant qualities of beams, pipes, and ducts emit melodic, enchanting, and often eerie sounds. Any visitor can step into the building and mess around on the keyboard. No piano lessons necessary. David Byrne is a Scottish-born musician living in the US. He is best known as the front-man of the Talking Heads from 1975-1991, a band inducted into the Rock and Roll Hall of Fame in 2002. Byrne is a true multi-media artist, who has produced several solo albums and also worked with film, photography, text, and every musical genre under the sun. He has been awarded a Grammy, Oscar and a Golden Globe. Photo: Justin Ouellette, New York, 2008. Video courtesy David Byrne. One wouldn’t necessarily assume that acoustics needed to be taken into consideration when designing architecture for the deaf. Yet acoustics constitute one of the five DeafSpace Guidelines, a code for designing accessible spaces co-developed over several years by US architect Hansel Bauman and many others. Since 1995 Bauman has been developing and testing these guidelines in close collaboration with the teachers and students at Gallaudet University for the deaf in Washington, DC. with input from several architecture firms. Because deaf people are hyper-sensitive to vibration, and many wear cochlear implants that pick up ambient sounds, a loud air conditioning unit or a hallway echo that the hearing barely notice can cause discomfort or confusion for a deaf person. Minimising noise, however, is only part of the story, and the other DeafSpace guidelines address various ways of maximising visibility. Having a conversation in sign language, especially while walking, requires that two people have enough space between them to see each other’s hands; therefore interiors conducive to deaf communication need to have wide, open spaces with clear sightlines. Light balance and colour palette should also be carefully mitigated to reduce eye strain. In 2008 Gallaudet first implemented the DeafSpace Guidelines in the new James Lee Sorenson Language and Communication Centre building, a joint venture between SmithGroup and Kuhn Riddle Architects. The SLCC was a true testing ground; many promising-sounding ideas were less of a hit in real life. One experiment in rounded corners for visibility, for instance, resulted in an unexpected side effect: walkers tend to speed up and crash into each other when hugging a rounded wall. After studying how users experienced the SLCC, Bauman and a university team planned the Living and Learning Residence Hall, a student dorm built in 2010 by LTL Architects, Quinn Evans Architects and Signal Construction. Hansel Bauman, Architect + Planner (HB / a+p) was established in July 2006 to address complex design challenges with an inclusive and considered approach to architecture and planning for higher education, scientific research, and community based projects. Bauman has over twenty years of experience in planning and design of facilities for education, scientific research, industry and residential communities in the US, Europe and Asia. The majority of this experience is drawn from his work with large, national design and planning firms. He is currently Director of Campus Design and Planning at Gallaudet University. This time glass corners, rather than rounded ones, were designed, large spaces prone to reverberation were carefully soundproofed, and a large multi-purpose room on the ground floor was subtly stepped according to the ground plane to allow full sightlines. Photo: Alexander Paul Brandes. Video courtesy Berlin Philharmoniker. Hans Scharoun (1893-1972) was born in Bremen, Germany and studied at Berlin’s Technical University (TU). His studies were interrupted in 1914, when he volunteered to fight in World War One. After the war he worked for Paul Kruchen in Breslau and designed the first exhibition of the expressionist group Die Brücke in East Prussia. From 1925-32 he was a Professor for Architecture at the Breslau Academy for Arts and Crafts. He was also a member of Bruno Taut’s expressionist architects group the Glass Chain and later the Der Ring architectural collective. In the late 1920s, Scharoun was responsible for the development of the Siemensstadt housing estate in Berlin. Inspired by Hugo Haring’s theory of new building, he departed from rationalism and began to focus on the organisation of social living space and the flexible allocation of space and function. He remained in Germany during the Nazi era and took up a professorship at the TU where he had studied in 1946. After the war he completed numerous buildings, the most notable of which was the Berlin Philharmonie. The German embassy in Brasilia was his only building outside Germany. His partner Edgar Wiesnewski took over the practice after his death and oversaw the completion of his later buildings, including the Deutsche Schiffartsmuseum (Maritime Museum), the theatre in Wolfsburg and the Staatsbibliothek (State Library) in Berlin. Berlin’s Philharmonie, built between 1960 and 1963, is one of the most renowned concert halls in the world. Designed by Hans Scharoun, it is part of the Kulturforum, a complex of buildings which also includes his Staatsbibliothek (State Library) and Mies van der Rohe’s Neue Nationalgalerie. While considered a masterpiece of expressionist modernism, it is as free from power play, pomp and ostentation as a building of this size can get. The architect, a product of the Bauhaus generation, believed passionately in a democratic architecture for the community, developing the concept of a city landscape, which should grow from the bottom up, arising from the needs of the community. This principle of “organic building” as Scharoun called it, found favour in the period of reappraisal post-war, and the resulting commissions mean Scharoun is now considered one of the defining German architects of the twentieth century. The Berlin Philharmonie is an architectural masterpiece famously conceived from the inside-out around the requirements of its acoustics. Designed by Hans Scharoun, the main 2,442 seater auditorium called the Großer Saal opened in 1963, but Scharoun died before the second, smaller chamber music hall, the Kammermusiksaal, was built. This had been designed in detail by his partner Edgar Wisniewski, who also completed the surrounding suite of public cultural buildings, the Kulturforum. As is so often the case in these “man behind the throne” scenarios, Wisniewski’s input is rarely acknowledged in textbooks, yet much of the Philharmonie’s success as a building is down to him. He died in 2007, but just over ten years ago, Sophie Lovell, uncube’s editor-in-chief, got the chance to meet Wisniewski, then a tall, striking man in his mid-70s, at the Philharmonie. She talked to him about a working life devoted to translating Scharoun’s simple yet revolutionary ideas – sometimes technically nightmarish to realise – into buildings of world renown. Yes, we worked together for 15 years until he died. During the latter part we were in partnership, which contractually means if one partner dies, the other carries on the work. And that’s what happened. Edgar Wisniewski in the foyer of the Berlin Philharmonie in 2003. When he died in 1972, I had all these projects, including the rest of the Kulturforum, to continue. The site was still a bombed-out wasteland then – though 30 years earlier it had been the busiest city centre in Europe. The final location, on the former Kemperplatz, is not far from where the old Philharmonie building had been before the war. During construction, the Berlin Wall came down. We stood here on the roof and watched the tanks rolling up and the barbed wire being laid. Some of the main workmen on the site had to come through the sewers to work every day from the eastern part of the city. The building was very close to the border, almost within firing range. Nobody knew what was going to happen next. How did your partnership with Scharoun come about? When I finished my studies at the Technical University in Berlin, Rügenberg, one of Scharoun’s assistants, recommended me for a post in his office that was available. Of course I knew who he was and had attended his lectures. I liked how he worked in an organic way: the form of his buildings developing from the inside out. Then the very first project that came up when I began working for him was the competition for the Philharmonie. It was very helpful that I was heavily involved with music. I was in a famous choir at the time, St. Hedwig’s Cathedral Choir, which the Philharmonic Orchestra under [Herbert von] Karajan played with. The larger auditorium of the Philharmonie, The Großer Saal, showing how “music is in the middle”. My knowledge and understanding of the repertoire helped form a good, trusting relationship with Karajan, who was the one that pushed the Philharmonie through. Karajan also told me once he’d originally wanted to be an architect. So Karajan was a decisive factor in choosing and building Scharoun’s design? Although the scheme had won first prize in the competition, there were intrigues: people wanting to hinder its construction from the start. The decision to build was won narrowly by a single vote, only after Karajan threatened to leave the orchestra – and Berlin – if it wasn’t built. His support was decisive. Was this support because of Scharoun’s idea of putting the “music in the middle”? The trust and understanding between us, Karajan and the musicians was very important because this idea of putting music, the orchestra, at the centre of the hall with everything else circled around it, was new – the Berlin Philharmonie was the first. Scharoun always said that it’s no coincidence that wherever improvised music is played, people immediately form a circle around it, and that this must be translatable to a concert hall. The whole design developed from that premise. Was the design driven primarily by the acoustics? Putting the music – the acoustics – in the centre had other important benefits too: Scharoun didn’t want any hierarchies. In the seating there are only slanting planes and stalls with no dress circle, apart from two galleries for special music performances, and there’s a single foyer for all. The idea of being up close to the action was also important. There are over 2,400 seats in the main hall, yet none is more than 28 metres away from the stage. That’s what’s so special about this space: you are so close to the people making music. This works the other way too: when you stand on the podium you feel how close the audience is, how they demand the best from you. The design of the Kammermusiksaal, or chamber music hall, was developed by Wisniewski from a sketch of Scharoun’s. I particularly like to sit in the choir seats behind the orchestra because you are so much inside it all. The whole floor, everything, vibrates there. Do you think visiting musicians and orchestras look forward to playing here? Since 1963, practically every great orchestra in the world has played here. But they do have to adjust acoustically. Many of them are used to playing in halls with a shoebox construction, with walls all around. Suddenly, here there is nothing – the flanking walls are relatively low, and some are angled, meaning part of the sound is reflected back to the orchestra so that the musicians can hear each other. The reflectors in the ceiling are also specifically designed to stop the echoes from the high ceiling. A relatively long, two-second reverberation time in the full hall was originally requested, because that is what’s needed for the late Romantic pieces such as Brahms, Brückner, Mahler and Strauss, as is the tradition of the Berlin Philharmonic orchestra. The only way to get this reverberation is with a large volume, which is why the ceiling is 22 metres above the podium. But then it comes down in a convex sweep towards the audience, who comes up to meet it, like coming up the sides of a valley. Mrs. Scharoun said it looked like a vineyard. I understand it was Lothar Cremer who worked out the acoustics. It must have been an intense collaboration. Yes, the first thing he said was that it wouldn’t work! There was nothing to go on. Nobody had built a hall like this before. There were no lasers and computers for measuring like today. We built a big scale model at 1:9 that you could stand in, and they fired a type of acoustic pistol in there, recording the results with microphones. And the Kammermusiksaal? You built that yourself based on a rough sketch from Scharoun. I was not only deeply involved with music, I also studied musicology at the Technical University, with lectures from people like Hans Heinz Stuckenschmidt, one of Schönberg’s students. Edgar Wisniewski (1930-2007) was a German architect. He was the son of an architect and pianist, and his interest in music and architecture was influenced by his parents’ house. He became the student and later partner of Hans Scharoun. After studying at the Berlin Technical University from 1950-1957, he was involved in creating the urban concept for the Kulturforum in Berlin. He was the artistic director for the Berlin Philharmonie, and oversaw the completion of the Staatsbibliothek (State Library) after his partner’s death. He later completed the state-commissioned Institute for Music Research, Musical Instrument Museum, and the Chamber Music Hall, based on a sketch by Scharoun. I’d learnt about the whole development of new music and was able to bring this to the design of the Kammermusiksaal, and it was Scharoun’s wish that I do – he was very open. He made just one sketch of it: not so much a design as an agreement that we make a centrally oriented space. Cremer said it was acoustically more complicated to build than the main hall, but when it was finished we didn’t have to make any acoustic adjustments at all. How much of the Philharmonie is you and how much is Scharoun? That’s something I wouldn’t even discuss in private! Many changes had to be made to the original design, to the staircases, the foyer, and so on. I designed a lot in the building. Even the gold aluminium façade is mine. Was it a burden carrying on Scharoun’s legacy? Scharoun’s and my own achievements are inextricably bound. From the initial planning of the Philharmonie, I simply moved on to the other big building projects of the Kulturforum. They represent more than 30 years of continual work. I never perceived the work as a burden, more a challenge. Do you see yourself as having lived in his shadow professionally? His name often only gets mentioned in relation to the Kulturforum ensemble. Yuri Suzuki is a Japanese sound artist, designer and electronic musician who produces work exploring the realms of sound between 1999 and 2005 he worked for the Japanese art project Maywa Denki after which he studied at the Royal College of Art. He has completed projects for Yamaha and Moritz Waldemeyer and in 2008 he opened his own London-based studio. In 2013 Suzuki was appointed as a tutor in the Product Design department at RCA, and became an associate for Disney, Teenage Engineering, and the New Radiophonic Workshop. In the same year he set up a consulting firm called Yuri Suzuki Creative Lab. The Dutch city of Utrecht is currently undergoing a massive inner city redevelopment that involves revamping the ruthless modernisation that the historical city was subjected to in the 1960s and 1970s. Today the area – once a playground for progressive urban planners – is considered an eyesore and has been largely demolished. But in an example of adaptation and survival, explains Thomas Dieben here, the Muziekcentrum Vredenburg, a 1,700-seat concert hall by Dutch architect Herman Hertzberger, has remained, albeit in a considerably altered form. And who is responsible for its 2014 radical redesign? The very practice that designed it in the first place. The original project brief was complex and progressive: to remove all musical boundaries and leave a platform for the hybrid experimental musical expressions that were thriving in Utrecht in the 1960s. In the final building, completed in 1978, Hertzberger elaborated on this by eliminating spatial thresholds, allowing shoppers and pedestrians to be confronted with music. Thus the foyers, hallways and the central music hall were like streets and alleys in a continuous public landscape. The main hall became an acoustic work of art where the innovative, concentric layout – with its steep, intimate connection between seat and stage – functioned together with a human-scale design, such as the high-backed couch-like collective seating designed to function acoustically like “hands behind your ears”. Patrick Fransen, project architect of the new Tivoli Vredenburg, praises the meticulous way of designing back then: “This was an age in which functionality and acoustics were designed with a sharp gut feeling and a few simple formulas – no computers involved”. Fransen’s task was to rethink his master’s work, with Herman Hertzberger himself – still actively involved in his office at age 81 – as supervisor. Despite the generation gap between both projects, the same main theme is addressed: a combination of diverse musical expressions in a single building. This time, however, instead of one space accommodating many sub-scenes, all organisational parties involved demanded independence in their use and identity. Thomas Dieben is an Amsterdam-based designer, who, after studying at the TU Delft and working in Paris, founded denieuwegeneratie, a young design studio focusing on urban culture and the public interior. Herman Hertzberger (1932) can be seen as the most important representative of Dutch structuralism and brutalism in the second half of the twentieth century. Closely connected to Aldo van Eck, he made his name with the Montessori School in Delft, the Centraal Beheer office and the Vredenburg Music Hall projects. His designs evolved further throughout the 1980s and 1990s, but still kept a clear focus on human-scale design. Herzberger has been actively involved in architectural education, and produced a series of publications, which have formed the basis for a generation of designers and teaching at various European universities. Still active in his office at age 81, he received a Riba Gold Medal in 2012 recognising his role in modern architecture. Sketch sound analysis of Bissingen Village, Germany, from “Five Village Soundscapes”, No. 4, The Music of the Environment Series, edited by R. Murray Schafer (reproduced by permission of the World Soundscape Project, Simon Fraser University). The sonic qualities of cities and urban spaces are the subject of growing research in “urban sound planning”, which is increasingly being used to inform the design of new cities. However, awareness of these qualities and their positive and negative aspects is nothing new, having been the focus of works by artists, audio documentary makers, sound historians, composers, architects and urbanists for several decades. Canadian artist and academic R. Murray Schafer, a key figure in the field of acoustic ecology and a founder of the World Soundscape Project (WSP), coined the term “soundscape” for his work on noise pollution in the late 1960s and early 1970s. From such negative beginnings, the development of studies, artworks and recordings of soundscapes and the utilisation of “found sounds” from field recordings have all contributed to a significant body of investigations benefitting artists, spatial practitioners and communities alike. Whilst the recording or collection of found sounds originated in the biophonic documentary recordings of natural environments, this activity moved indoors some time ago. Practitioners such as Francisco Lopez have recorded the sounds of buildings derelict or otherwise, overlaying and massaging these sounds into controlled recordings suitable for aurally bombarding audiences in blacked-out listening spaces. Other artists, such as Janet Cardiff, have deployed high-end technology and spatial manipulation to place participants and observers into the soundscape of a specific place (both real or abstract) regardless of their actual location. For example, Cardiff created her work The Forty Part Motet from a version of one of the finest examples of early music, loosened from its physical demands (five choirs, forty singers, a decent choir stand) by the use of forty carefully placed speakers. The simultaneous music and acoustic environment converts the selected physical location into a sacred chapel space – sound as the manipulator and creator of architecture, both sited and siteless. More recently, the collection of found sounds and haptic soundscapes has moved into the fetishisation of “geophony”, with the increasingly available means of documenting urban spaces through the sounds that locate them – physically, historically, culturally. Melonie Bayl-Smith is an architect, musician and educator from Sydney, Australia. An adjunct professor at UTS School of Architecture, her project, studio and research collaborators span institutions and practices across Australia, Europe and the UK. She writes for AR Asia Pacific, AA, Artichoke, Cyclic Defrost, and contextfreesound amongst other publications. Cities such as Melbourne, London and Montreal now have online city soundmaps readily accessed for use by the public, featuring “pins” that indicate the location of a particular environment and the activities typical of that recording site. The value of these maps is variable – recordings range from the mundane to those of real social significance, including lost sounds inherently reliant on human interaction, such as trading or manufacturing activities. Paperback, 568 pp., 6 x 9 in. Carson Chan is an architecture curator and writer. He co-curated the 4th Marrakech Biennale (2012), and was Executive Curator for the Biennial of the Americas (2013). He is currently pursuing a PhD in Architecture at Princeton University. For our third guest-reviewed bookmarked section, we’ve asked curator/writer extraordinaire Carson Chan to choose three tomes exemplifying his taste in text – one very fat, one deliciously savoury, and one we will describe only as “interesting”. The fact that we’re able to reproduce most things with unprecedented speed today doesn’t make the copy contemporary. This revised and updated edition of a book on the concept of the copy by poet and cultural historian Hillel Schwartz brings us back to ancient Greece before getting to photocopiers and the Internet. Schwartz is known both for his translations of Korean poetry and his writing on everything from the politics of sound, fat, millenarianism, and French prophets. Since the book’s first printing almost 20 years ago, it has itself appeared as pirated PDF copies on online file sharing sites – but reading this physical re-issue (especially if you’ve read the first edition), brings the subtle and beautiful meaning of the copy home. Objecthood aside, read it for Schwartz’s erudite prose, particularly if you’re a wordsmith. Paperback, 96 pp., 7.8 x 5 in. Both WH Auden and John Updike have praised Mary Frances Kennedy Fisher’s prose as second to none. The mid-century American food writer has an easy clip to her words, and she describes food with the same pearly efficiency we recognise in Hemingway. In homage David Foster Wallace named both his 2004 essay and 2005 book Consider the Lobster, after this 1941 volume of hers. Fisher’s original tome, peppered with recipes throughout, is a series of her memories and ideas related to oysters, recounted as if told by the doyenne herself at a cocktail party. We learn that her mother loved the oyster bread served at her school dormitory in the 1890s, that the best oysters she ever ate were prepared at an inn in France, and that Cicero nourished his eloquence with hundreds of oysters each day. Hardcover, 344 pp., 9.3 x 6.3 in. Photo: Gigi Cifali, "Chadderton Baths, Oldham", 1937-2007.